Eugene O’Neill doesn’t traffic in subtlety in his expressionist play The Hairy Ape. Using the conceit implied in the title, he mines the widening divide between the working and ruling classes. 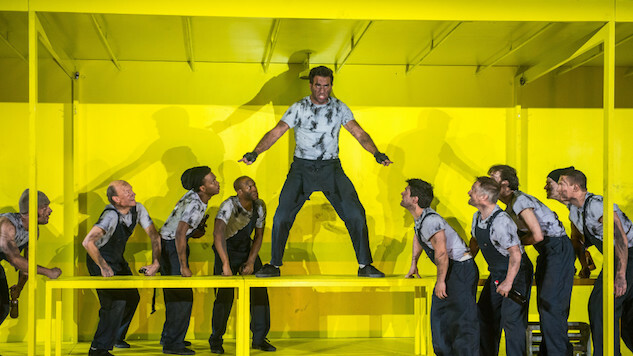 Though it was written in the 1920s, the theme of being a cog in the system feels utterly relevant in Richard Jones’ recent production at the Park Avenue Armory. The venue’s uniquely cavernous space provides Jones and designer Stewart Laing the opportunity to create a larger than life set to represent the wealth of the steel industry that O’Neil captures. The main piece is a rotating stage that wraps around the audience and looks like a giant gear in a machine. Besides being a slick and ingenious design piece, it acts as a material representation of the main character Yank’s (Bobby Cannavale) relationship to the industry he helped create. In this world, the workers toil far out of view of those who benefit from their labor and are covered in a dirt which can never quite be scrubbed away. When the company’s young heiress (Catherine Combs) glimpses Yank at work and likens him to a wild beast, it triggers a primal anger that launches him down a dark path. He begins to identify with the caged apes in the zoo and the more he sees himself as one, the more he behaves as one. A random street brawl he instigates lands him in prison, which further radicalizes him. When he goes to a meeting for the Industrial Workers of the World with violent plans, they throw him out and laugh at his naivety. Cannavale delivers a viscerally charged performance that drives the show. He roars with conviction but also hints at the vulnerabilities that lie just below the surface. There’s an irony that Yank’s primal descent is brought about by all too human feelings: of feeling insignificant, unheard, and unvalued. He sees the world he’s helping to build and just wants a little credit for it, but this game is not in its first round and the rules have been long established if not explained to its lowest ranking players. David Costabile (best known for playing an affably nerdy meth chemist who meets a fatal end on Breaking Bad) plays an older worker who’s been beaten down through decades of long grueling shifts. Yank goes head to head with him in arguments that teeter on the border between verbal and physical. While these easy victories embolden Yank, they ultimately prove hollow blueprints for confronting people with real power. The aggressively blunt dialogue can grow tiring, but viewed in service of an allegory, it feels somewhat fitting. There are some thoughts that subtlety fails to express and need to be declared with a wallop. This sense of a breaking point propels the play foreword to its tragic conclusion. Little seems possible in the face of the muscular gears that grind towards progress, crushing everything in its path.